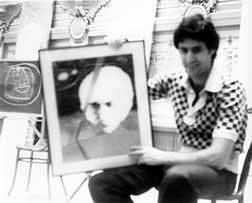 Uri Geller In the 1970s, Uri Geller became a controversial personality; appearing on television, radio and giving many public performances. The Israeli psychic could bend spoons, start broken watches and move objects with his mind. This immediately began a firestorm between believers and nonbelievers. Is he a fraud and a con artist? Or, does he actually have extraordinary abilities? As the story goes (which may not be a story, but the truth) Uri was in a garden at the age of 3. There, he had a Close Encounter; the young Geller was 'programmed' with these incredible capabilities. For those of you interested in reading about Geller, I suggest buying his books and logging on to his website. 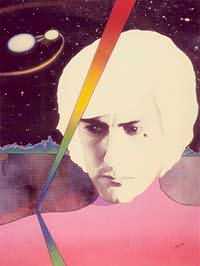 For those of you interested in reading about the extraterrestrials behind his powers, read 'URI - A Journal of the Mystery of Uri Geller' by Andrija Puharich. This journal includes numerous encounters with UFOs. We discover that ETs known as SPECTRA chose Geller for the work ahead. At this point, a skeptic might ask: why? This question was answered in Puharich's book: 'All that is happening has one reason: education - they are preparing us for something.' Why are there crop circles? Maybe these are just signs that there is something more. Skeptics came out of the woodwork and attacked Uri Geller. The psychic divided America as well as the rest of the world. There are positive people who are open-minded and there are negative people who love to criticize. A war began between Uri Geller and the magicians. These magicians (who truly are conmen, deceivers and tricksters) would not accept the fact that someone really had phenomenal abilities. It must be a trick; it could not possibly be real. The Amazing Randi, who I call the not-so-amazing Randi, became well known...not because of his magic...but because of his criticism of Geller. He had the nerve to write a negative book using Geller's name in the title. The magician tapped into Geller's popularity to put money into his own pocket. What a con job! Randi should get down on his knees and thank Geller; for without him, no one would ever have heard of Randi. In Geller's book 'My Story' there is a photo with the caption: 'Failing on the Johnny Carson show.' Why go on one of the most watched TV shows in the U.S. and FAIL...if you are a trickster? Your tricks should have worked. The eyes of the world were on him and the psychic was nervous. Plus, Carson (an amateur magician) was prejudiced by his advisors. This contributed to a negative environment and Geller was unsuccessful. Barry Bonds does not hit a home run every time he steps to the plate. This indicates, to me, that Uri Geller is human and not deceiving anyone. Why are the magicians so offended? Why is Randi behind Skeptic Magazine? What does being a magician have anything to do with skepticism? Here is the answer: Magicians, unfortunately, do not believe in magic. To them, there is no phenomena...everything is a trick and everyone is a conman trying to take your money. How sad. I assure you, dear readers, THERE IS MAGIC IN THE UNIVERSE. There are wonders beyond your wildest dreams. [I'm sure I will receive hate-mail for this article; as I've received because of my Shroud and Nostrodamus articles. That comes with the territory, I guess. But, the response has been 20-1 positive and complimentary. My reply back to these skeptics is: It's easy to criticize, it's hard to understand. Take the harder road and investigate yourself with an open-mind. Stop being negative]. Geller's abilities have been PROVEN by Stanford Research Institute, UCLA, Kent State, Birbeck College University of London, Foch Hospital Lab in France, Lawrence Livermore Radiation Labs, U.S. Naval Ordinance Labs and other prestigious institutions. That is not why I believe in Uri Geller. I can speak with certainty because of a few 'personal experiences' which are the best teachers of all. I came home from work one day to discover my wife (who was psychic and now an ex-wife) in an excited state about who was on television. It was this psychic, who we had never heard of, performing on the Mike Douglas Show. I sat down and was instantly intrigued. When Uri Geller said to go find a broken watch, I remembered one we had in this 'junk' drawer. I pulled on the drawer and there it was: ticking away! This was very strange because the last hundred times I opened it, the watch remained broken. I don't know why it wasn't thrown away. Why was this time, when we attempted to mentally start the watch, the one time where it worked perfectly? Television stations would be flooded with phone calls because of Geller. The phenomena actually happened in people's homes when Uri made television appearances. + There are 8 Flair pens with their pocket clips in various positions up to 90 degrees; 2 have broken off completely. + There is a set of 10 keys and 8 of them are bent. + 7 spoons and 2 forks are bent. + A thick, kitchen drawer handle is very bent. + Something sliced through a large pair of metal scissors chopping off the ends. The cuts, an inch and a half from the tips, are smooth, not jagged. + A sample, metal, Social Security card is warped. + There is also a broken off television antenna. The antenna is an odd story. We woke up one morning to find both of our TV aerials bent almost 90 degrees like floppy, rabbit ears. I was half asleep and began to rebend one of the antennas back into position. Well, you can't physically bend a TV antenna. It broke off in my hand. Kathy got worried and became very upset. She was thinking that this power was destructive. When we came back into the room, we were startled to see that the remaining antenna had straightened all by itself! There it stood; a TV with a straight antenna and the other broken off. We took this as a sign that everything was all right. This thing that was happening, whatever it was, was not from a destructive source...but a positive one. We would often open our silverware drawer and discover that half of the utensils were bent. We would have to rebend our silverware just so we could eat! Kathy and I would have to explain to dinner guests why there were kinks in our utensils. On 5/5/76, Geller appeared on a local, live television program in Pittsburgh called the Marie Torre Show. Uri was given an envelope and was asked: what was inside? Geller got it wrong. He said: Is someone thinking Star of David? In our living room, Kathy was holding a Star of David pendant at that same moment. Later, the same day, Geller was on the Roy Fox Show on KDKA radio. Something compelled Kathy to tune in. She called and called to try to get through and speak to Geller. On the phone, she told Uri that she was the one thinking Star of David earlier that day. Uri turned to the radio host and said: 'I don't know this woman. I didn't tell her to call at this time.' You see...Geller had been doodling, on a pad, the Star of David. Later, Kathy called hotel after hotel trying to find where Uri was staying. I got a ride from a friend and we headed off to a Marriott Inn. We stayed there for quite a while looking for Uri Geller. It was like a needle in a haystack. But, the way this day had been going, (it was my 25th birthday) I had a good feeling we would run into him. And, we did. Uri and his friend, Shipi Shtrang, passed us in the hall. They had gone to a Pirate baseball game. I introduced myself; that it was my wife with the Star of David. He invited us into his hotel room where we talked for nearly an hour. I remember I had more to say about aliens than he did...also, he was impressed when I showed him a photo of our baby, Rose. Geller wrote free passes to a performance he was giving next month at Pittsburgh's Soldiers & Sailors Auditorium. Geller wanted to give us a souvenir and offered to bend one of our keys. But, the only key we had was my friend's car key. We couldn't get home if he bent that...so Uri took his Marriott room key and began gently stroking it. This was not planned; it was spontaneous; it was done a foot from my face and it certainly BENT. We were believers. There was no negativity in the air. The key, room 620, began warping within seconds. It was a moment I'll never forget. On 6/18/76, myself and Kathy attended Uri's performance. We got word to him that I had a drawing that I wanted Uri to see. His 'act' was mind-blowing and he beat the odds in many respects. There was a point when Uri asked the audience if your keys have bent or watches have begun to work, please come forward to the stage. Our spoons and keys bent as well as the thick kitchen drawer handle. I marched forward and was a little surprised that it didn't happen to everyone. About 5% of the crowd experienced the Geller-Effect. But, as soon as Uri saw me, he said: 'No. Not you. I don't want to deal with you.' I was shocked as I made my way back to my seat. Kathy and I figured that Uri only wanted to work with people he had never seen. Someone may have seen us together at the Marriott and thought we had this planned. This tells me that the man has integrity. Kathy and I were able to talk to him on stage after everyone had gone. Shipi took photographs of us and he liked my drawing. Another strange thing occurred a few months later. ESP Magazine ran a front cover with bold letters: On Sept. 1, 1976 at 11pm E.D.T. THIS COVER CAN BEND YOUR KEYS. This truly was a happening with Uri Geller (and anyone who wanted to participate) concentrating at this specific time. The public was to place their keys, spoons and broken watches on the magazine and see if the focused energy would have any effect. Also, a 2-digit number was going to be transmitted and people were to see if they could accurately receive it. Again, our spoons bent, but not very much. What I remember is: We had a broken air-pump on our aquarium. I placed it on the ESP issue at the appropriate moment. We concentrated. I hooked it back up to the tank. The pump worked so strongly; it was like there was nothing wrong with it. We did receive the 2-digit # correctly: it was 42. On 10/7/76...Kathy, myself and a friend named Bruce all concentrated to again generate this unusual ability. We sat cross-legged on our living room floor with our hands about a foot over a spoon. (Most of the utensil-bending, I admit, I did not directly observe. Rather, we found them that way in the silverware drawer). On this occasion, we witnessed the spoon bend in less than a minute. It could not bend any more. The handle touched the scoop part of the spoon. How does an UNTOUCHED spoon decide to curl up in 30 seconds? I know this because I labeled the spoon: 10/7/76 with Bruce. I would be very upset if someone took a spoon from my box of special bent stuff and physically changed their shape. I want them in the shape they are in because I know that they were not physically bent. Kathy and I divorced in 1977 and the Geller-Effect has not happened around me since way back then. I have recently emailed Uri who, naturally, barely remembers my personal experiences. He was nice enough to give me permission to write this article. So often public opinion is nowhere near the truth. Do not be swayed by skeptical people. I would rather know the truth and be in the unpopular minority than go along with the crowd and be so far away from the truth. On a Where Are They Now? episode, I found out that Geller has been very successful finding (dowsing) oil, gold and water for big companies. No one is going to pay large sums of money unless they are convinced that their source of information is legitimate. What a wonderful article. Not only are you an artist, but you are a good writer too!